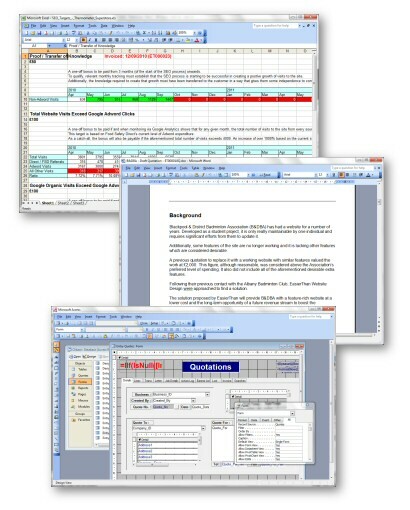 With experience of working with Microsoft Office since it was first created, we can provide training, support and advice on using Excel, Word, Powerpoint, Access and Outlook. This can be delivered with a set itinery or ad-hoc as described in the case study below, both at rates suitable for a small to medium business. Over the years we have encountered many users undertaking long winded processes to achieve something, simply because they didn't know there was a better way to do it. Our experience has shown that just a few hints and tips on usage can save a significant number of working hours over time, thus significantly increasing the productivity of yourself and / or your staff. With little experience in using spreadsheets, but a willingness to learn, Centurion Blast Cleaning Ltd asked us to do some Microsoft Excel training on-site, focussing particularly on some inherited accounting spreadsheets. During the visit, the training was very fluid, with the customer driving it and asking the specific questions they needed the answer to. After just two hours with EasierThan Business Software, they felt confident to carry on alone, with the option to telephone us at a later date with any follow-up queries. With over 25 years software development and support experience, we can tackle most projects. Please visit our About Us page for further information. Testimonials from a number of clients are also available. If required, we also offer Website Design and SEO Services, which can be integrated to any software solution. Based in Cleveleys on the Fylde Coast in Lancashire, EasierThan Business Software are well placed to offer Business Software to companies, individuals and organisations in Blackpool, Preston, Lancaster and surrounding areas.